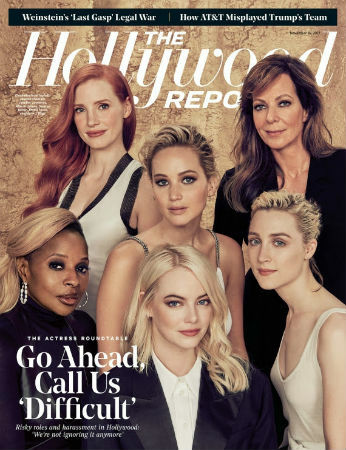 -The Hollywood Reporter’s (too white) actress roundtable includes Jennifer Lawrence, Emma Stone, Mary J. Blige, Jessica Chastain, Allison Janney and Saoirse Ronan. -The reviews are in for Justice League, and they are not good. -The X Files’ next season will premiere Wednesday, January 3 on Fox. That’s way earlier than anyone anticipated. -My goodness, I enjoyed Pink’s Carpool Karaoke. She’s a great car singer and seems like a good egg. -Wait, are Dakota Johnson and Chris Martin dating? How did I miss this?!? –Ben Affleck joked about the Hollywood sexual assault scandal in an interview and it did not go over well. -Also, that Medium story that was floating around last night about her friend being raped turned out to be fake, so stop sharing it. -Meanwhile, Sophia Bush calling out E! is the type of quality content I live for. –Terry Crews detailed his alleged sexual assault by agent Adam Venit. -Gossip Girl’s Ed Westwick accused of sexual assault by a third woman. -Five actresses revealed how a CSI casting pro urged them to disrobe in paid auditions. –Rose McGowan says she’ll plead not guilty to those felony drug charges. I think she has a strong case. The whole thing is shady. Alleged residue? -I’m cautiously intrigued by the news that Taraji P. Henson will star in the new, gender-flipped version of Nancy Meyers’s What Women Want. –Miranda Kerr is expecting a baby with Snapchat founder Evan Spiegel. -I can’t wait to play the Hallmark movie drinking game! -I don’t particularly think This Is Us is a good show, but I do like that it features so many crying men. -The season 4 finale of You’re the Worst airs tonight, and FX just announced that they’ve renewed the show for its fifth and final season. I’ve struggled to get through this season, but I’m hopeful it will get better now that they get to end it on their own terms. –Brad Pitt is reportedly “determined to have a fully resolved” custody arrangement with Angelina Jolie soon. -How many times has Outlander been on the cover of EW? It’s getting weird now. -The first footage of Deadpool 2 is a Bob Ross spoof. Ok. So, Is Brad Pitt Being Investigated For Child Abuse Or Not?